The Shining Æse, carrier of Gjallrhorn, also known as Rig, was the watchman of the Norse Gods. He is less well known than a number of others and much of his lore was lost. Let’s explore what can be found about Heimdall as well as a few things that can be implied and what in the watchman may appeal to parts of us. Come share what can be learned from this most perceptive of gods. How should one periphrase Heimdallr? By calling him Son of Nine Mothers, or Watchman of the Gods, as already has been written; or White God, Foe of Loki, Seeker of Freyja’s Necklace. 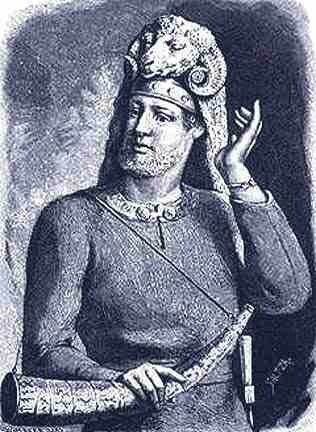 A sword is called Heimdallr’s Head: for it is said that he was pierced by a man’s head. The tale thereof is told in Heimdalar-galdr; and ever since a head is called Heimdallr’s Measure; a sword is called Man’s Measure. Heimdallr is the Possessor of Gulltoppr; he is also Frequenter of Vágasker and Singasteinn, where he contended with Loki for the Necklace Brísinga-men, he is also called Vindlér. Úlfr Uggason composed a long passage in the Húsdrápa on that legend, and there it is written that they were in the form of seals. Heimdallr also is son of Odin. 35. A certain one was born in days of yore, With greatly increased power, of the race of gods; Nine bore him, a man full of grace, Giant maidens on the edge of the earth. 37. Gjalp bore him, Greip bore him, Eistla bore him and Eyrgjafa, Ulfrun bore him and Angeyja, Imdr and Atla and Jarnsaxa. 38. That one was increased by the might of the earth, Of the wave-cold sea and the blood of a sacrificial boar. The Lay of Rig describes how Heimdall leaves Asgard to travel to the land of men. There he fathers children with three families, and thus the creation of the three social classes. It is not exactly clear why it is Heimdall who plays this role and not Odin, who, according to the mythology, created the first man and woman. Greater and lesser, kinsman of Heimdall. Slayers of each other from the Gylfaginning: Loki shall have battle with Heimdallr, and each be the slayer of the other. From the Gylfaginning: When these tidings come to pass, then shall Heimdallr rise up and blow mightily in the Gjallar-Horn, and awaken all the gods; and they shall hold council together. Know that you may not find many kindred spirits (Eric knows one and he is online). Heimdall is obscure to many, even fairly knowledgeable practitioners. Just because Heimdall and Loki oppose each other does not mean you need to translate that directly into your personal relationships or use it to color your perceptions in life. This entry was posted in Gods. Bookmark the permalink.